In recent years, the Arctic has increasingly become a focus of climate research, due to the fact that the climate changes observed so far in the Arctic have a much stronger impact than in other regions. The reasons are complex interactions between atmosphere, sea ice and ocean - difficult to quantify and to describe in models. In order to improve the understanding of the specific processes and interactions, more measurements have to be done on site. Yet only a few continuously measuring stations and mobile measurements with ships and aircraft are available as a database to provide the necessary parameters for analysis and modeling. In the project, funded by the German Research Foundation (DFG) and entitled "Investigations into the small-scale vertical and horizontal variability of the atmospheric boundary layer aerosol with unmanned aerial systems," the correlation between small-scale air turbulence and the formation of the smallest airborne aerosol particles that can form from gases is investigated in particular. Since these small particles can grow and then scatter light and also influence the formation of clouds, they play a major role in the climate. 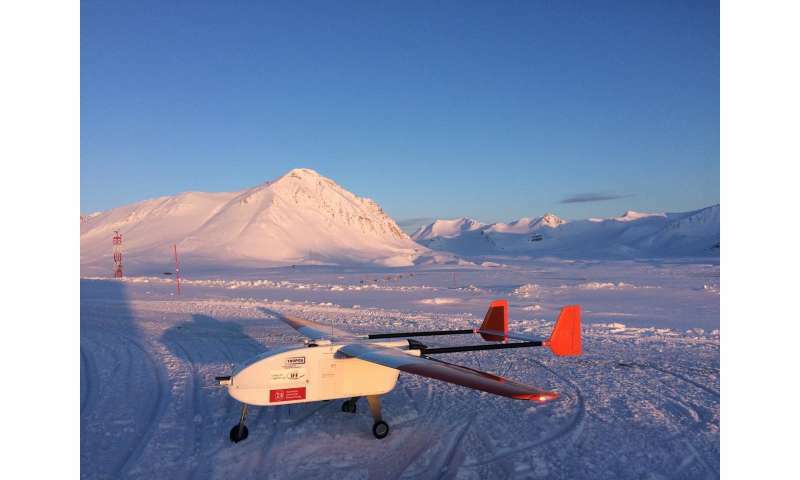 The measurement campaign was the third major study by ALADINA (Application of Light-weight Aircraft for Detecting IN-situ Aerosol), an unmanned aircraft system (UAS) was developed at the Institute of Aerospace Systems at Braunschweig Technical University. ALADINA is a type of high-tech model aircraft: It has a wingspan of 3.6 metres, weighs 25 kilograms and can transport up to 3 kilograms of payload. The battery allows a flight time of up to 40 minutes and a speed of up to over 100 kilometres per hour.